Get precise cooking results you can depend on with this Ancona Elite Gas Cooktop. Constructed with 430 grade stainless steel, it features heavy-duty cast-iron grates and electronic ignition with flame failure safety device. Everyday meals and holiday feasts will be a breeze with this gas cooktop. Consisting of sealed burners, it allows you the ease of boiling, frying or searing on high heat or simmering on low heat, without the worry of food spillage. The individual triple ring burner offers greater surface space and the flexibility to position large pots and pans. The cast-iron grates are easy to handle and remove for cleaning. The Ancona Elite Gas Cooktop offers style, function and performance, creating an optimal culinary experience. Tronic's XL TFK Induction Stove takes up little space, is light and can be carried easily. Ideal for students, on a holiday, on a terrace, while camping or as an addition to your existing hot plates. Built in child lock for added safety. Power: 1800 Watt, Voltage: 120/60Hz - VDE Standard plug - LED Indication - 9 Power levels - soft touch sensor with knob control. Create great-tasting meals with this 30-inch GE gas cooktop. Its electronic ignition system instantly produces a steady, even flame, and the 15,000 BTU center burner emits an intense heat that rapidly brings liquids to a boil. This black GE cooktop's five sealed burners provide ample space for your cooking needs. With clean graphics and effortless operation, the Caribbean elegantly combines value with virtue. Smooth clear black glass, durable, and easy to clean, with safety features uniquely Kenyon. Both one and two burner models available in 120, 208, or 240 volts, with push-to-turn controls, infinite heat control and quick-to-heat radiant ribbon elements. Safety features include heat limiting cooking surface protectors, and On indicated light for each burner, and a Hot burner indicator light. And as all Kenyon products, backed by uncompromising quality and an exclusive 3-year replacement warranty. 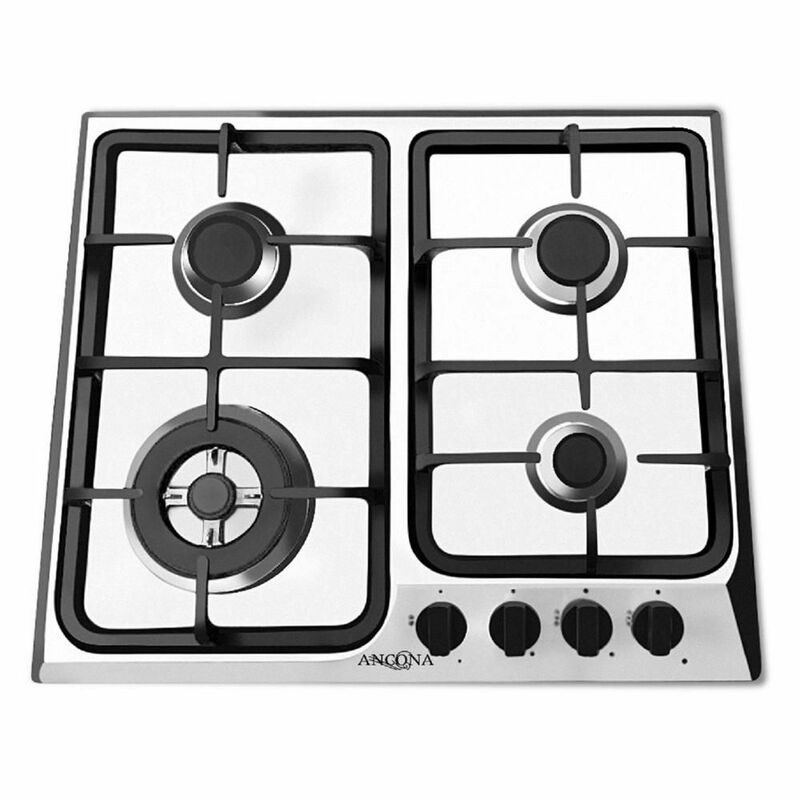 24 inch Gas Cooktop in Stainless Steel with 4 Burners including Triple Ring Brass Power Burner Get precise cooking results you can depend on with this Ancona Elite Gas Cooktop. Constructed with 430 grade stainless steel, it features heavy-duty cast-iron grates and electronic ignition with flame failure safety device. Everyday meals and holiday feasts will be a breeze with this gas cooktop. Consisting of sealed burners, it allows you the ease of boiling, frying or searing on high heat or simmering on low heat, without the worry of food spillage. The individual triple ring burner offers greater surface space and the flexibility to position large pots and pans. The cast-iron grates are easy to handle and remove for cleaning. The Ancona Elite Gas Cooktop offers style, function and performance, creating an optimal culinary experience. 24 inch Gas Cooktop in Stainless Steel with 4 Burners including Triple Ring Brass Power Burner is rated 5.0 out of 5 by 4. Rated 5 out of 5 by Eno from Very good, simple and adorable. I like it.... Very good, simple and adorable. I like it.